Fine fabrics, and Swarovski rhinestones sparkle through out the studio of Inez Gill. 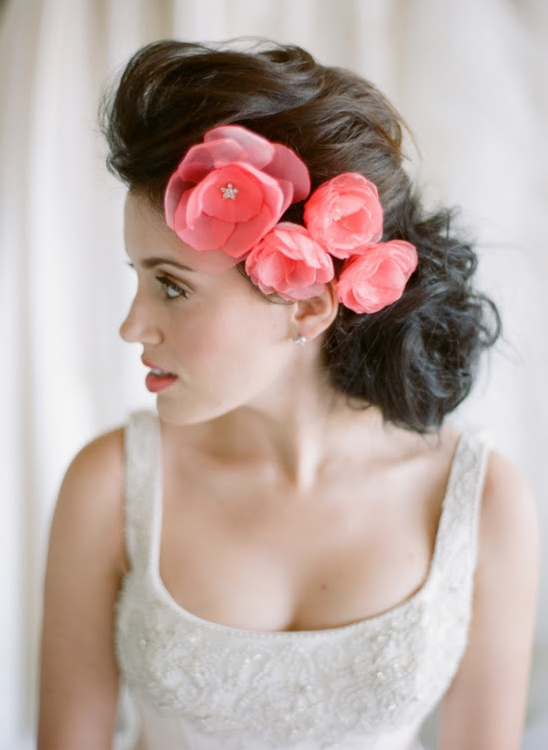 Each headpiece is handmade using original Inez Gill patterns and then hand-sewn to create the lush signature flowers. Each collection is carefully created with the goal of bringing each headpiece to life with attention to the shape, material, and details of the individual piece. The Inez Gill bridal collection features flowers, veils, headbands, sashes, garters, flower girl headpieces, and our signature reception headpieces. They specialize in creating custom pieces that showcase each brides personality. View all of incredibly gorgeous accessories here and don't forget to take a peek at their Wedding Chicks vendor page. Join us again tomorrow for another Wedding Chicks vendor happy hour. To get information on becoming part of The Wedding Chicks, and join all the fun, email us by clicking here.